Team Stryker Mission 009 begins now! First off I just want to apologize for the delay between Mission 008 ending and Mission 009 starting. I was hoping to get the issue up and running much faster, but life has kept me very busy so far this year with no signs of stopping. Hopefully I’ll be able to continue to bring you Mission 009 with as little interruption as possible. Now for the cover of Mission 009, this is a very special cover as it’s the first ever two page spread cover for an issue of Team Stryker. When the book gets printed the cover will span the back and front covers. If you’ve been following Team Stryker on Facebook and Twitter than you’ll know that Mission 009 is going to take place at a McRonald’s restaurant (more on that to come). I wanted the issue to feel like a class kid’s place-mat that you’d get at any fast food establishment back in the 80’s and 90’s. 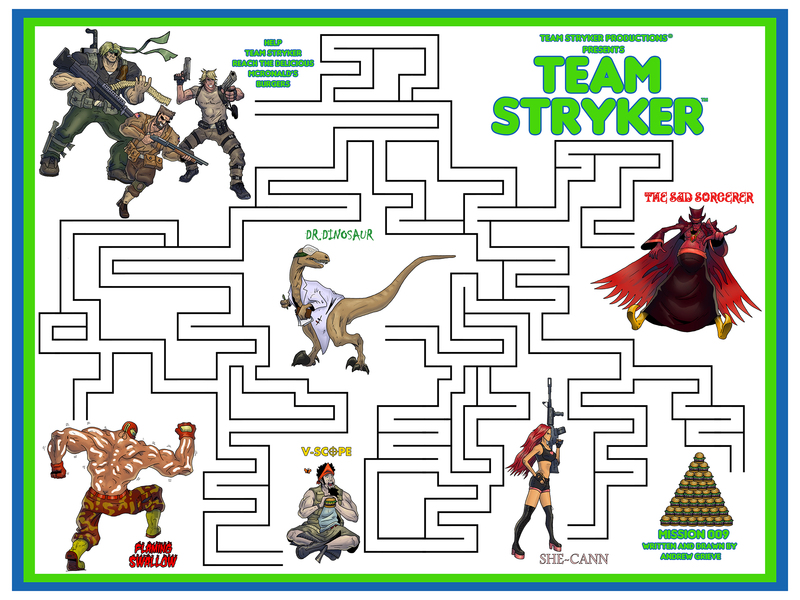 It’s been a while since I had to order anything off the kid’s menu, but I thought a Team Stryker maze was the perfect way to start the issue. If you want to see the full sized version just click here (feel free to turn this into a place-mat and send me pics). To coincide with the debut of Mission 009, I’ve started a Patreon for Team Stryker for anyone interested in supporting the comic and me. Team Stryker will always be free, but if you’d like to support the dream of having Team Stryker one day be a full time job and career it would incredibly helpful! I hope you enjoy Mission 009 as much as I enjoyed making it.